What if on Thanksgiving Day you could share food with a hungry person a world away? What if you could feed hundreds or thousands of “silent guests” on Thanksgiving? Actually you can, with FreeRice, the award-winning online game which helps feed the hungry. When you play FreeRice you answer questions in many subjects including vocabulary, math, etc. For every correct answer, 10 grains of rice are donated to the UN World Food Programme, the largest food aid organization. 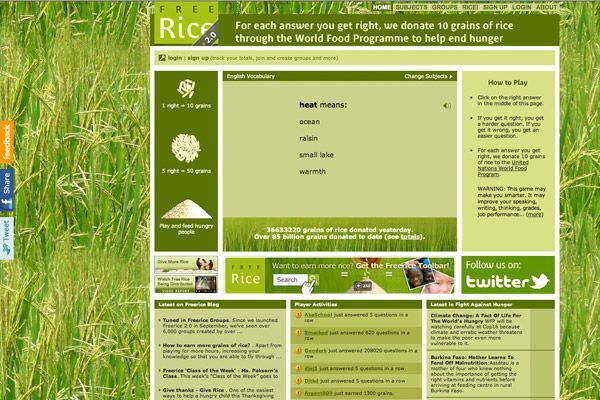 This year I had the opportunity to write some of the questions that appear in the new FreeRice section on world hunger. I have also been encouraged by the response to the game. Recently, I wrote a story on the great work Ithaca College’s Food for Thought organization has done with FreeRice. This is part of their ongoing campaign against hunger which is highlighted by the Walk for Plumpy’nut. A College of Mount St. Joseph student, Elizabeth Paff, has been promoting FreeRice as part of an upcoming campus walk event against hunger. The St. John’s Church in Delhi, Ohio told me they are playing FreeRice with some of their school programs. FreeRice has raised money to feed schoolchildren in Haiti after the earthquake. Currently FreeRice donations are headed to Niger, a country in Western Africa that has suffered a severe drought this year. In addition, Niger is host to thousands of refugees from a conflict in the neighboring country of Mali. We saw this year how tough drought is and how it can lead to higher food prices. In Niger, where farmers have less technology and means to cope, the consequences of drought multiply. We can throw this country a safety net by playing FreeRice. So after turkey this year, make some time for FreeRice. By simply playing this game, you can invite a “silent guest” into your home on Thanksgiving, and help feed people a world away in Niger. Visit FreeRice.com to start playing. Article first published as FreeRice Can Feed the Hungry on Thanksgiving on Blogcritics.